These are snippets out of the diary of Louie, our marmoset, with the hopes that it one day saves the life of another marmoset or tamarin. It was September 2009 and we finally went to the long awaited exotic animal auction located in Macon Missouri. 4 times a year Lollibros organizes an exotic animal auction where you can find all kinds of exotic animals for sale, including primates. 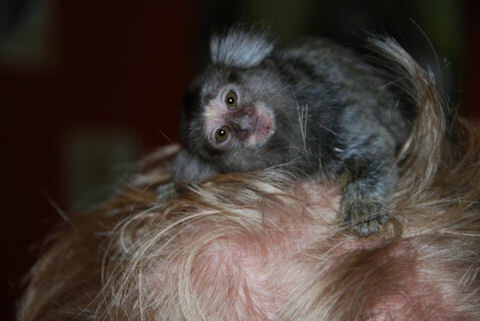 After waiting for 6 hours, we were finally able to bid on a male common marmoset monkey. While the bidding process was a bit stressful, we eventually bought Louie below market value which was of course the reason we decided to buy at an auction instead of a breeder. There are risks associated with buying at an exotic animal auctions but it was one I was willing to take. On our way home Louie had a blast running around in circles exploring his new environment. The last few days Louie has been doing rather well. He’s clearly way more active than any other marmoset I’ve ever had. As a matter of fact, he made it nearly impossible for me to work on Saturday due to the fact that he kept running around on my desk tapping the keys of my keyboard. Yesterday we went to Six Flags (which was boring as always) and left Louie at Jo’s (mother in law) where he was left out of his cage nearly all day. Today, since Pam was sick, Louie was kept inside of his cage during the day. When I came home Louie was very cutely cuddled up in Pam’s shirt. LOL, I believe that was the first time I’ve actually seen Louie cuddled up during the day. When it was time to make supper, Pam handed Louie over to me where he kept playing hide and seek. It does sound unbelievable but it seems marmosets are known to love play hide and seek. They’ll basically hide behind one side of you back, and when you look, they basically run to the other side. Needless to say Louie is able to play this game forever. We’ve been getting more people over the floor lately wanting to see Louie. Since he’s out of his cage most of the time, Louie greets most strangers by jumping on them or hanging out on their shoulders. If they’re lucky they might even get a kiss from him. Little did I know that this cute behavior would lead to the end of his story. Louie is about 6 months now. He’s been eating solids without any problems although I still give him a bottle from time to time. However, the last few days he hasn’t been eating very well so we’ve switched back to his bottle since he still seems to like that. It’s Saturday morning and Louie is clearly not doing very well so we decide to call the vet for an emergency visit. He just seemed to have a seizure so I’m rushing to get there. Since we don’t have a vet in our neighborhood that is experienced in primates, our regular vet that takes care of our cats and dogs does all the necessary tests like blood work and decides to give him fluids. He calls a vet that has a lot of experience with marmosets to explain all the symptoms. He emails him the blood work and a series of pictures which show small blisters in Louie’s mouth. It seems Louie has Herpes Simplex, one of the most common deaths among marmosets and tamarins. Herpes Simplex comes from kissing a person that has Herpes Simplex also more commonly known as cold sores. Even if the person doesn’t have the cold sore at the time, they can still contract the disease from them. There is still no cure for Herpes Simplex and the disease is very painful for marmosets so we had no choice but to let him go. I should have known better, I should have done the necessary research but I didn’t. I wrongly assumed that as long as the person didn’t have a cold sore that a marmoset or tamarin wouldn’t be able to contract the disease but that is not true. From what I’ve read a lot of people actually carry the Herpes Simplex virus but will never show any symptoms that they do. Moral of the story? Don’t let anybody kiss your marmoset or tamarin or get yourself tested before you decide to get a marmoset or tamarin. It might all look very cute but once your marmoset or tamarin has contracted this disease, the chances of their survival are very slim especially when they’re less than 1 year old. Once infected they typically die within 5 days of developing signs of the illness.